From the Strawberry Shortcake Pop! Vinyl collection by Funko. Strawberry Shortcake and Custard Scented Pop! Vinyl Figures. This Item is in stock and ready to ship. You should not postpone your purchase and miss out on adding Strawberry Shortcake and Custard Scented Pop! 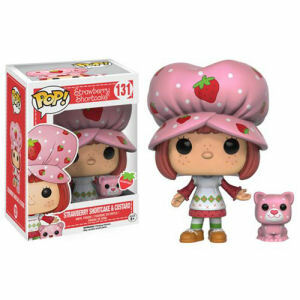 Vinyl Figures to your Strawberry Shortcake Pop! Vinyl collection! From the Strawberry Shortcake Pop! Vinyl collection by Funko. Strawberry Shortcake and Custard Scented Pop! Vinyl Figures. Measures 3.75 inches high. The sylized figure has a rotating head and comes in a displayable window box. Funko Strawberry Shortcake Pop! Vinyl shipping from Canada. No Surprise Border fees or Customs!